An amazing Colossal squid was caught last month by fishermen in Antarctica's Ross Sea. It is now on ice, awaiting examination and preparation for its permanent display in New Zealand's national museum. Once un-frozen, the creature will be embalmed and then preserved in a natural position. The Colossal Squid was first recorded in 1925 after two tentacles were recovered from a sperm whale's stomach. 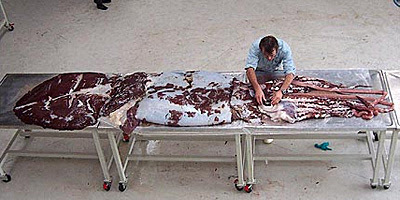 Since then, only a handful of colossal squid have ever been sighted because they live very deep in the ocean. Two others were found in the Ross Sea, and one turned up near South Georgia in 2005. Now scientists are pondering how to thaw out the squid evenly. Zoologist, Steve O'Shea of the of Auckland University of Technology, said it could take days for the creature to defrost at room temperature - meaning that the outer flesh could rot by the time the centre thaws. So one option is an industrial-sized microwave oven that could be used to defrost the animal evenly before it is embalmed. Scientists and curators at New Zealand's national museum, Te Papa Tongarewa would like to preserve the amazing specimen for detailed study and display. Don’t say we didn’t warn you Steve, you know what happens when you radiate animals: they grow gigantic and attack the city!